There are some things in the world I am good at, but posing is not one of them. I will never learn how to pose for outfits. I swear. My mother and sister keep pointing out my legs are not well-positioned, nor do I look remotely comfortable. Both statements are accurate, shown in Exhibit A. Did you know my Mom made this hat? She crochets, while I knit. That's why I have a seemingly endless amount of hats. I'm knitting a blue ribbed beanie as I type. Knitting is soothing especially during the stressful and heart-aching weeks of exams. Luckily, they are over! Sort of. I have two final papers, but English Literature isn't until next month. Until then, I can try and pretend to relax. So I was glad to take some time off to hang out with my little brother. As much of a bumbling shut-in I am, it's nice to just walk around somewhere with someone you love. It clears the mind and makes you forget, even if it's just for a few hours. I'm about to go out to watch Mad Max: Fury Road with my dad and brother now. I've heard such great things about it, including how feminist it is. I know little to nothing about the film so I can't wait to see it. The excitement cannot be contained! Have you seen Mad Max: Fury Road? What did you think about it? Looking amazing as usual, Bash, and good at posing or not, you look so good! Mad Max is AMAZING. Can't wait to hear your thoughts about it because it's hella feminist, and the film-making core of it is simply superb! Have a great weekend! Loooove a bit of double denim! And I really want to see Mad Max, as I've only heard good things about it. Me too! I love Tom Hardy! ;-) Hope to get the chance to see it next month! I like your posing the way it is, Bash! It looks very natural and it's YOU! Please don't change you because of somebody! ;) Really happy your exams are over, dear so you can show us more of your outfits! Haha! 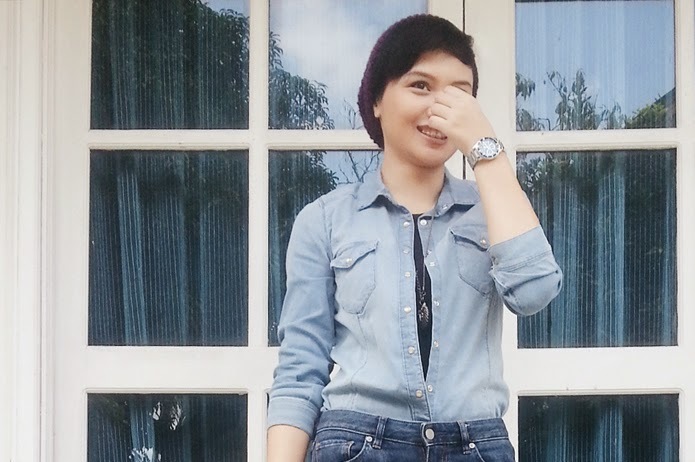 :) Adore your denim on denim look! You've styled it perfectly with black and your unique beanie! Have an amazing weekend with you family, sweetie!!! 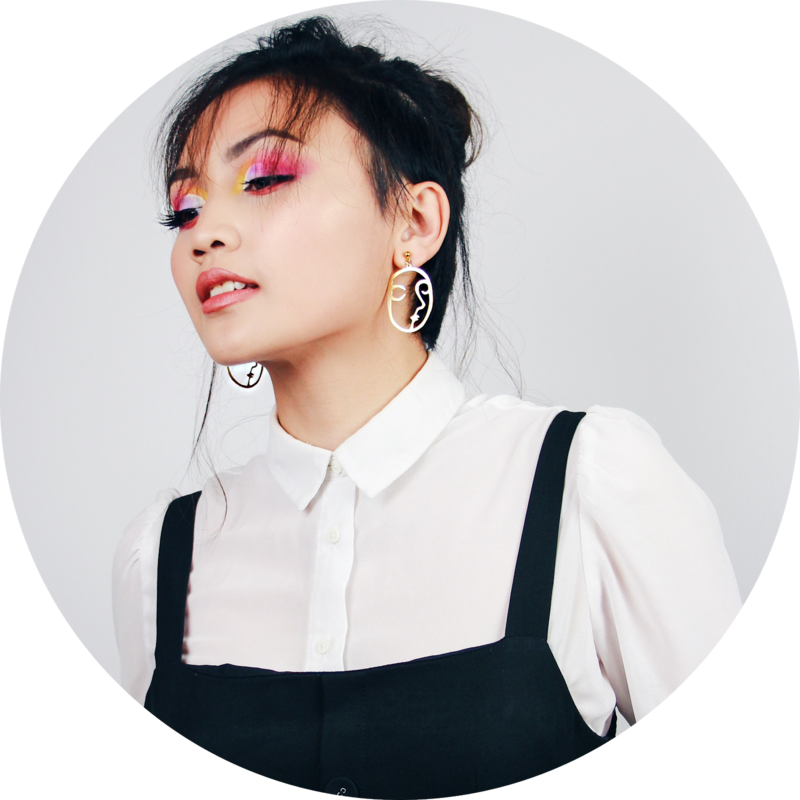 Hi lovely, Ok, you said in the the 10 things about me post that, we won't see much of the outfit post because your body shape or something like that, well I have to tell you that you look stunning and Please more outfit post, you are gorgeous and so sweet! love this look. Have a great weekend. Love the hat, your mom is so talented! I can't pose either...my problem is I just feel awkward. 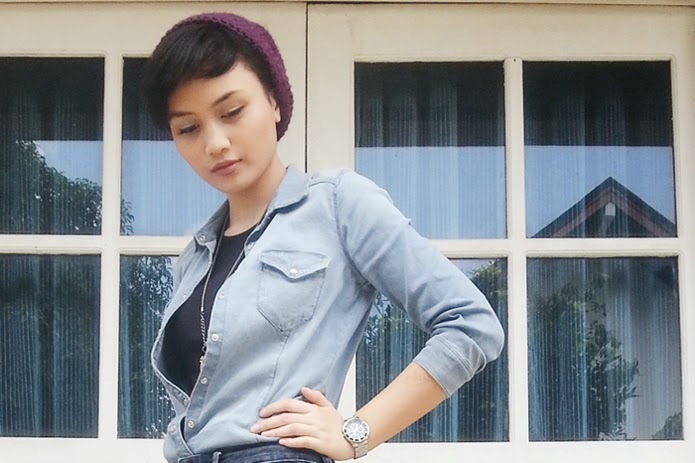 Love the beanie :) And double denim, alrighttt! I always love double denim. You made the look your own with the hat. So cool it's from your mom. I love denim on denim!! U look so cute!! Hat look great with your outfit!! You look really good here! Tomboyish yes but very trendy too and wow, you knit? That's something that I wanted to learn but could never get the hang of it. Great post! I love the hat- it's so fun to incorporate homemade items like that into your wardrobe, especially when you're away from home! Doesnt look like u r not good at it and such lovely outfit. Like this look. Denim on denim can equal a great outfit but only if the right denim shades are mixed together. Yours are perfect and your hat is so cute. I have not seen the Mad Max film but the reviewers indicate there is a strong representation of strong women so it is a must see film. There are so many movies I want to see right now. Love the outfit! You are so stunning and this look really suits you! 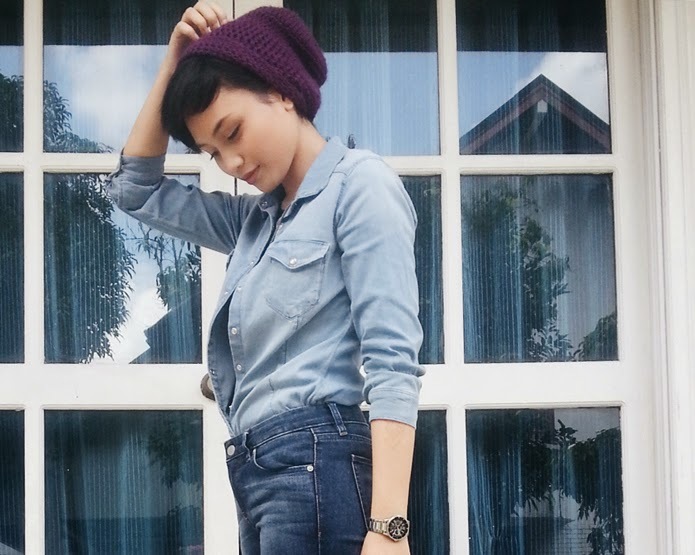 Especially the short hair with the beanie! Im obsessed! Oh I love all denim outfits!! Trust me it is always hard to pose for the camera haha it can be pretty awkward :P Though your poses are great! I adore the denim on denim look and I just love how your mom made that hat, so cute! I am so loving this casual denim look. And I love the pop of color from your hat. Cute look girl. It's a great hat, tell your mum well done! You look great Bash, looks like such a comfy outfit but yet stylish! Love the denim on denim look! I know what you mean, I find it quite hard to find good poses for outfits. Also, what a great hat! Your mum is so talented! :D Thanks for sharing Bash, have a nice weekend! That´s really cool ;) I love your style! You really rock this look, i love double denim! I love your hair cut too really shows off your face! 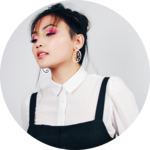 following on bloglovin and on google + great blog!! Cute outfit- I love the risk of double denim, and it looks great! Love your look, comfy yet cool and stylish still! Love this edgy style! Well, edgy for me anyways. I haven't seen it yet but I definitely want to! So hopefully I'll find a spare few hours to go check it out. You look gorgeous btw, very cool outfit! LOVE the beanie. You look amazing in that outfit. Let me tell ya - you're better at posing than I am! Hence, why you will almost never see outfit posts on my blog. That's really cool that you knit! I tried but I could never get the hang of it! Your posing is actually so good! Also, I love this look so much! It's the perfect casual yet fashiony look. I love the denim look on you! 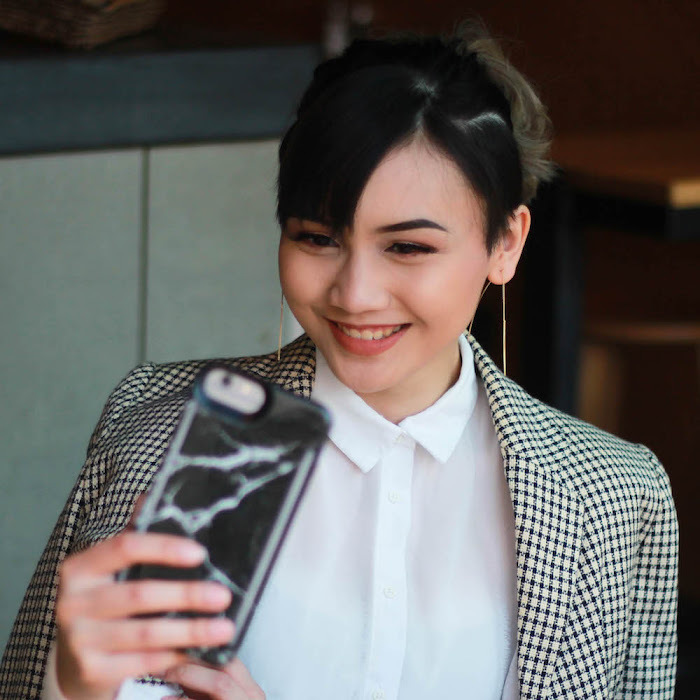 You look so gorgeous in these photos! I really like the first pose on the first picture (the middle). This outfit is really cute on you. I would suggest looking and practicing simple poses from magazines in a full-length mirror. Take pictures of them and practice them until it becomes natural and you can do it from memory. This way, you can just strike a pose at any time and always be sure it will come out looking the way you want it to. Trust me, I have felt so silly doing this, but it has helped me (so, I wanted to pass it on to you). I agree with you about the walking with someone you love part. That is always nice. Hope you have a great weekend! Oh my gosh! I love this. I have a chambray shirt that I've been thinking about pairing with denim. I haven't bitten the bullet to try it out in public. But I love the way it looks on you. Let's see if I can replicate the look flawlessly like you. We love this double denim look! Our mum knits and crochets, and we barely can knit! We agree it is so soothing even though we aren't great at it! Denim on denim can never go wrong! 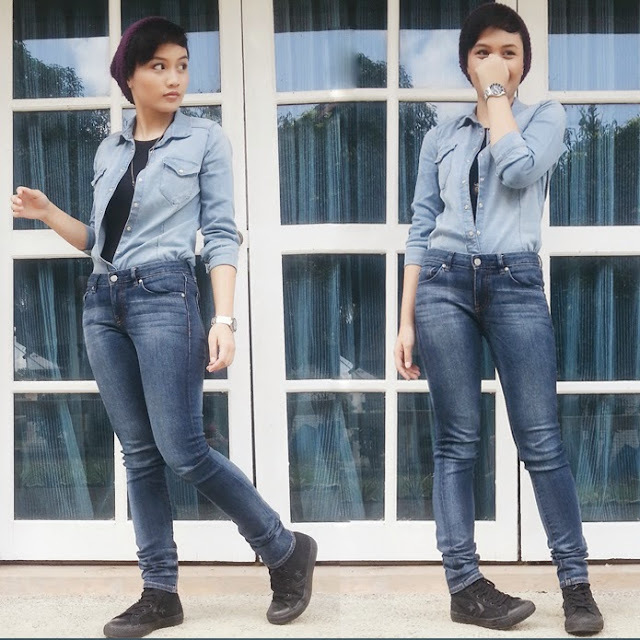 You rock the tuckin double denim style, the outfit just match nicely. Love the bennie hat tho..
Love your outfit! I am sort of like your neighbour haha! I'm from Malaysia. and your beanie. omg can I ask your mum to do one for me as well? cus it's too cute! Love your double denim look, so cute. Love your outfit, really casual and pretty! I feel your pain for outfit posing haha! the outfit is gorgeous btw, loving the ruggish, boyish feel to it! Wow! First time in here and I love your blog!! Your style is just stunning! You are totally rocking double denim! I really want to see Mad Max! I've heard great things, and it looks visually interesting. I hate posing too hehe but you did a great job! Love your outfit as well! Great look! Denim looks are always amazing. I love this outfit and your beanie is so cute. I think you're pretty good at posing, you don't look stiff and awkward like me! Haha. I haven't see Mad Max yet but hoping to soon! Cute look! I love your hair! Gorgeous! Loving this jeans and the hat so much! Great casual look x You can check out my new blog post talking about my top summer accessories and featuring a new jewelry brand. Have a lovely day dear! Great outfit! Love the beanie! I love this denim outfit! You look really awesome! The hat is very cute! Absolutely loving this style ! Hey, despite claiming to be bad at posing, you look pretty awesome to me! Also love that you are showcasing your mom's crocheting talents! Really love this look, the hat is perfect on you ! cool outfit i like it!